Iowa's Superchief are not your typical metal band. Their debut full-length album, Corporate Dynamite, boasts an unpolished sound and their no-nonsense approach makes them difficult to categorize--but that's not necessarily a bad thing. Corporate Dynamite's opening track is "Fear No Shield". Part I of the song is named "The Getaway". It has an acoustic guitar intro that is very medieval sounding. Heavy electric guitars soon kick in, lending a bluesy hard rock feel. As Haldor Von Hammer's low, rough vocals hit, he sings intensely and powerfully. The song's main riff is catchy, and the bass line is deep and striking. "The Getaway" ends in the acoustic manner in which it began, but the song continues as Part II: "The Standoff" for another two minutes. It incorporates similar themes as in Part I, but with a heavier sound. Following "Fear No Shield" is the intriguing "Odin Be Praised". This song wastes no time being hard and heavy right from the start. Von Hammer's intense singing style is very obvious on this track, as it becomes so vehement. The way he sings the line "Good GAWD / Mah LAWD / I gotta get my friction on!" in the chorus amuses me to know end and makes this song so memorable. The vocals aren't the only stand-out part of "Odin Be Praised." It features a good guitar solo accompanied by some seriously heavy drumming. I also enjoyed the Viking imagery in the song, as it fits really well with the rock 'n' roll image and attitude. Corporate Dynamite's title track has a brief spoken intro, which sounds like a police scanner type radio playing a conversation between two men about a building that's on fire. One of them slowly and very deliberately says "burn baby burn" right before the music hits. The music itself starts with a heavy bass riff from Jason Boten, then Ricc Terranova and Jason Monroe join in on guitar. Von Hammer's vocals are his most forceful yet, as he sings about rebelling against the corporate world and "sticking it to the man". The chanted "Stand up! My fist raised!" lyric is just as stirring as it is catchy. The album's final track, "Destiny's Child", begins with the barely noticeable sound of someone racking the slide on a gun. It's so quick you just might miss it if you're not paying enough attention. Drummer Ryan Marcum starts playing a slow march and the guitars are gradually added into the mix. The guitar is a lot mellower on "Destiny's Child" than the others, and the tones often sound much brighter. This overall bright sound contrasts with the rather harsh vocals that appear on this track. Occasionally, the vocals do lighten up, especially at the end of the refrain. "When the Bear is Hungry (He Will Eat)" is Corporate Dynamite's fun and light-hearted bonus track. It is predominately the title repeated over and over with shouted backing vocals, but it's actually a cool song. The guitar solo is brief, but it is very good--much better than what I expected from such a goofy song. Although the shortest song from Corporate Dynamite clocks in at 3:41 ("Odin Be Praised") and the longest at 7:06 ("Fear No Shield"), many of the songs feel like they drag on a bit. This probably has something to do with the Superchief's style, which is kind like the metal version of a jam band. Clutch is the only band I can think to draw a comparison with. Superchief's Corporate Dynamite has such an unrefined sound. Listening to it almost feels like listening to a demo, but a well put together one. The album's name Corporate Dynamite and the ongoing theme of rebellion lead me to believe that this is just the sound Superchief was going for. They definitely succeeded in getting their point across. 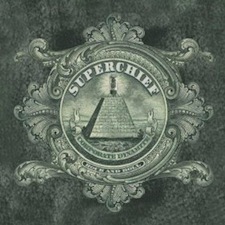 Superchief's particular sub-genre of metal is hard to pinpoint, but any rockers who are into the bands like Clutch--and others that play the bluesy and seemingly endless jam session type songs--will certainly enjoy this band and their album Corporate Dynamite.